nanakat 15 Μαΐου 2014 - 11:57 μ.μ. Season five of THE VAMPIRE DIARIES began with a sense of hope for Elena (Nina Dobrev). After a passionate summer with Damon (Ian Somerhalder), Elena headed to Whitmore College with Caroline (Candice Accola), not knowing that Bonnie (Kat Graham) sacrificed her life to save Jeremy (Steven R. McQueen). 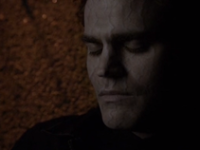 As Bonnie’s friends fought to bring her back to life as the Anchor to the Other Side, Stefan (Paul Wesley) had to face-off with his doppelganger Silas, and a newly human Katherine (Nina Dobrev) struggled with mortality and motherhood. Damon’s relationship with Elena was put to the test when Enzo (guest star Michael Malarkey), an old vampire friend from Damon’s past, revealed he was still alive and looking for revenge. Stefan and Caroline’s friendship deepened as they stood up to the Travelers, a nomadic witch tribe driven to strip Mystic Falls of magic and cast out its supernatural residents. Finally, having lost his town and fearing losing his loved ones on the crumbling Other Side, Damon made a huge sacrifice to bring them all back – to catastrophic results. While the cliffhanger will send our characters reeling, season six will be the story of their journey back to each other as they explore the duality of good versus evil inside themselves on their quest to reclaim their home. Based on the series of books by L. J. Smith,THE VAMPIRE DIARIES is from Bonanza Productions Inc. in association with Outerbanks Entertainment, Alloy Entertainment, Warner Bros. Television and CBS Television Studios. The series was developed by Kevin Williamson (“The Following,” “Scream”) & Julie Plec (“The Originals,” “Kyle XY,” “Wasteland”), who serve as executive producers along with Leslie Morgenstein (“Gossip Girl,” “Pretty Little Liars”) and Caroline Dries (“Melrose Place,” “Smallville”). damonforever 17 Μαΐου 2014 - 11:25 π.μ. ασχετο αλλα εχετε παρατηρισει οτι στην πρωτη σεζον ο ντειμον ειχε κατι επιπλεον δυναμεις οπως το κορακι και την ομηχλη και τωρα οχι !!!! γενικοτερα οσο μου αρεσει αυτη η σειρα αλλο τοσο ειναι μεσα στα λαθη ! πχ Σχολειο πηγενουν μια φορα στο τοσο διοτι εχουν πολλεσ γιορτεσ και οταν πηγενουν εχουν μαθημα ιστοριας μονο !! επρεπε να το κανουν πιο ρεαλιστικο ...! Panagiotis Voyatzoglou 19 Μαΐου 2014 - 11:37 π.μ.